Today I have been thinking about Hans. He was a Swedish fellow at our camp in the Amazon--68, but looking much older, thin, grizzled... 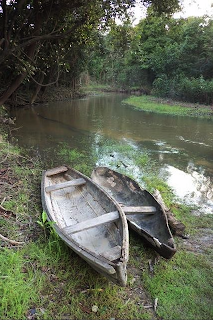 He was there seeking out a shaman to heal him of his colon cancer, as he would relate at dinner, while chain smoking unfiltered cigarettes, surrounded by mosquito netting, and resonating co-mingled sounds from the jungle. As he talked, I began to understand his calmness when helping me on the phone as we were trying to find our way to the camp days before, me obviously stressed. He was the only one around who spoke English, so he was put on the patchy cell to talk to someone he didn't even know--but his voice was slow and clear as if to say "Why are you worried. This is nothing to worry about. You'll find your way." The Shaman had Hans on a regime of diet and ceremonies, most of which took place in smoke filled jungle huts away from other eyes, but when it was all finished 3 days later, Hans lamented "that he didn't feel what he was told he would." He didn't think it was helping, afterall. He became withdrawn and silent. The last time I heard of Hans, he had loaded up his belongings into a dug out canoe, and was headed up river to look for another healer... Perhaps this one "legitimate." I have never seen such a mixture of despair and hope on any human before...just there on the surface... no peeling away of layers necessary...Hans had nothing to hide any more. No reason to be anything other than what he was. So today I am grateful for having met Hans. Because it reminds me of what a beautiful thing life really is, and how we take it for granted, thinking each day will automatically lead to the next. So thanks to Hans for that reminder, and here's hoping that he found his way. I had been thinking about my friend Nick a lot these past few weeks. For some reason he was on my mind...even though I was half a world away...even though I wasn't as of yet aware of his sudden illness. Standing in front of St. Basil's Cathedral in Red Square one day--my first time in Moscow-- I had the distinct feeling that I'd already been here! 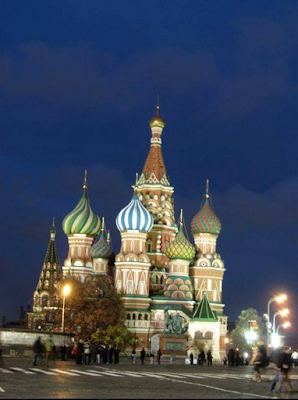 The iconic onion domes and their riot of color became mutated as the sun began to fade. I bundled up my 20 euro coat that was my wisest purchase on a former trip to Venice (I'm notorious for never having a jacket when I need one, except on this rare occassion) and now, with a distinct European look, I imagined it allowed me to blend in amongst the jean wearing, black jacketed Moscowvites. That was until I realized that the fur hat I'd bought in the local flea market-- a fitting Russian souvenir-- probably gave me away as the tourist that I really was. It was cold for me that day, but when I asked my friend Kostya if Russians really wore hats such as these, or just us tourists, he laughed and said "Well, maybe in Winter." So anyway…here I was, on a solitary night, with a petrified Lenin to my right, resting waxedly and incommunicado in his mausoleum, looking--if he could-- ironically towards the massive 100+ year old monument to capitalism, the GUM department store on my left, Red Square firmly below my feet, and St. Basil's a silhouette against the graying sky, and lights fading like sand running through a glass, marking the passage of another day. And then, just when you think the scene is over, that the world is going to sleep once again on this little plot of land that has seen so much tragedy and triumph, an array of lights hit the domes, and the brilliance of this structure that has endured it all, came to life in a whole new and wonderful way. As if to say: I'm not done just yet. Even Stalin, apparently, when he was rearranging the statues in Red Square to make room for massive military parades noted the importance of St. Basil's. When the architect showed him a model in which the cathedral had been torn down to make room for more tanks. He famously yelled: PUT IT BACK!" It was then that it dawned on me! Just why I'd felt like I'd seen this site before. Been here before. And that feeling didn't come from a photograph. We've all seen the photographs… What I remembered was an imprint and a feeling and a sense of place. An impression in time... A story. And that's when I knew why…. Because Nick Cardy had been here before. And just like Nick, he had painted this very riot of life and tangents, and his works were etched in my mind… as well as his voice… his artistic voice and the real one. I can hear him now, with the built in chuckle, relating to me his stories of being in this very spot--and I visualized the little shoe shine boy who seemed amazed by the stick of gum Nick gave him inside this same church.. AND the Russian soldier that asked for one too; the lines of tourists following a flag, the sight of which reminded Nick for an unwieldy caterpillar, and so he painted it that way. Yes, the art-- the art to go with the stories, always infused with that Cardy humor. One piece in particular that I remember is of a stout Russian lady, broom of gathered twigs and twine in hand, sweeping the leaves in front of the cathedral-- you'll notice in Moscow that there never seems to be any trash, but there is a dirth of trash cans! These plain woolen dressed women with the scarves tied around their heads, I imagine (and so did Nick), are the reason why--juxtaposed in front of the grandeur of the Kremlin, sweeping, sweeping, as though to uncover the layers of history that had happened on this spot. Mr. Cardy painted all of that.
" I need to take a picture of myself and show it to Nick." I thought. "He'll get a kick out of my being here." And no doubt the picture would bring a cascade of wonderful stories and "Nick will regal me for an hour or two." In fact, that's how Nick and I first became friends. 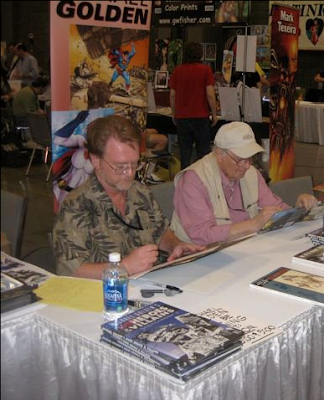 It was at the Baltimore Comic Con, circa 2008 and artist Michael Golden and I had the good fortune to be seated at the table with the legendary Nick Cardy-- artist of "Bat-Lash," "Aquaman," "Teen Titans," and one of the best cover designers DC Comics has EVER had. It turned out to be an amazing evening of stories and laughter and fun, the dinner part of it ending with Nick receiving a Lifetime Achievement Award from the Hero Initiative. I felt so honored to be there with Nick, as he humbly walked on the stage and accepted this great honor with his usual wit and humor. Afterwards, in the glow of the spotlight, Nick alighted himself in a leather bound chair in the hotel lobby, and allowed himself a rare glass of scotch or some such thing. There was an empty chair beside him, and having enjoyed the dinner conversation so much, I took it for my own. Stories and jokes later, we realized it was 3 am. These are rare and treasured moments…. you know the ones. When you meet someone and you feel as though you have already known them forever. That was Nick for me. And we were friends ever since. It was a friendship that would lead to working together as well. 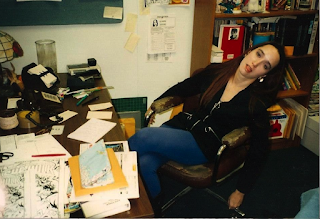 Since 1997, after having been an Assistant Editor and Editor at DC, Marvel and Topps, I'd been running my own little publishing company for art books, portfolios and such, named Eva Ink. Doing so puts me in the nice position of being very choosy about the projects that I work on. And being able to produce labors of love. So, you can imagine my excitement when a few years after meeting Nick, Golden and myself were at a show in Tampa and decided to drive to Sarasota to visit him. While there, Nick showed us around and gave us the grand tour of his artwork-- much of which he still had-- western paintings, super heroes, portraits, and of course the aforementioned travels to Russia. Again, each one had a wonderful commentary to go with. Todd Dezago was there as well, and the day sped by, in excellent company. Just as we were about to leave, Nick said, "Hey, I don't think I've shown you these." He then handed a binder to me, I opened it up, and what unfolded before my eyes was a unique and inspiring story. 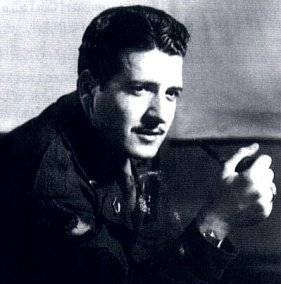 You see, during World War II, Nick had been an assistant tank driver. A job that he readily admits he wasn't in the least bit ready for. He didn't even know how to drive a car, much less a TANK! "Remember seeing all the those edges of buildings chopped off in Belgium," he'd say "That was MY work." While Nick may not have been a tank driver, he was an artist! And he did what an artist does. 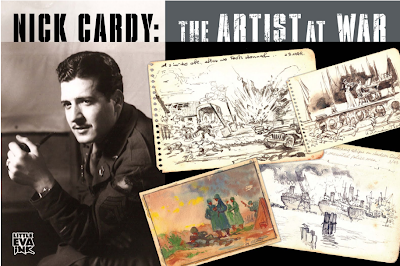 He fashioned himself a small watercolor kit in a Sucrets tin, and packed away a small drawing pad, and with this, throughout his 3.5 years in the War, and two Purple Hearts, he chronicled his experiences. 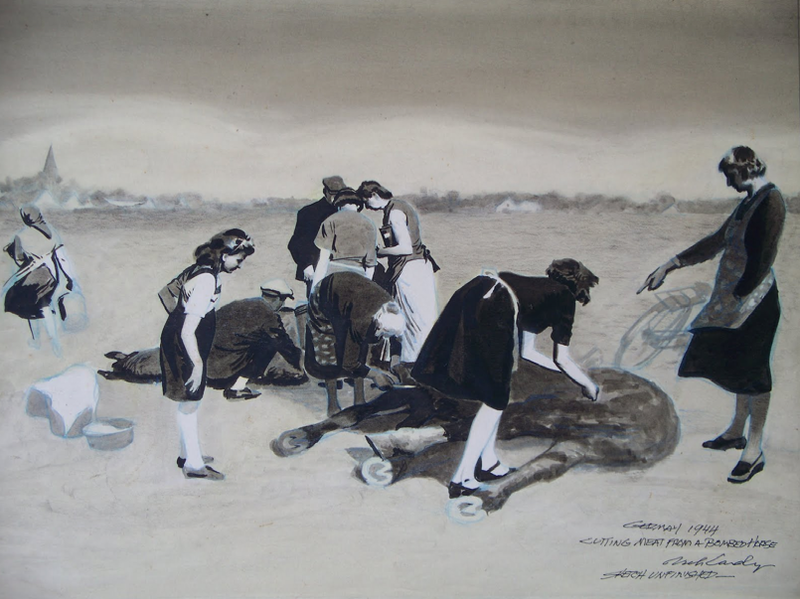 What I was holding in my hand was one man's story of the War as told through his artwork. "Nick, we have to make a book of this," I said. Feeling an incredible and urgent need to preserve what I saw and show it to others. In fear that something so special might just vanish without anyone really knowing about it, as so many things sadly do. "Do you think anyone would want to read it," he said. The answer in my head was "Hell yes!" But I replied: "Of course! I want to read it. Others will too." That was typical Nick. So humble. So, we began the process of scanning, and interviewing Nick and writing, and putting the book together... I still have all the tapes. It all took the better part of a year. The result was "Nick Cardy: The Artist at War," and it's one of my favorite books I've written, and to date, and true to my prediction, it has appeared in two versions all over the world. The first, the US version by Eva Ink Publishing, printed the same size as the actual sketchbook-- something I felt I wanted to see. And the newly released coffee table edition from Titan Publishing, released as a large impressive coffee table book. And I do think, Nick enjoyed all the interviews and all the attention paid to his sketchbook. The most recent interview published last Veterans Day in the Huffington Post. And I hope he also realized how important this artifact really was, as people had the chance to thank him for his service. "I got the draft letter on April 1st. April Fool's Day," he laughed . "I was working at Will Eisner's studio then, and I'd hoped it was some kind of joke, you know. But of course it wasn't… I was just a kid, " he said, "We all were, on either side. And we were all scared. Just people in a terrible situation and trying to live. To get back home..."
When you take something so big as World War II. Something so terrible, so all encompassing, it's hard to grasp the import of it all. But when you distill it down to one person's story, one journey, it truly brings the event to life in a whole new way. And you are "there" in some aspect, in a way you never were before. Nick gave us that with his sketches. We followed up this book with a tome that covered Nick's comic, movie, and advertising work, "Nick Cardy: Wit-Lash," a title that Nick liked because he'd laugh that it was a "take off on your last name "Witterstaetter" and "Bat-Lash." That wasn't the intent, but he liked the joke. The sad thing about having a friend in their 90's is that you know the time is limited. The good thing about having a friend is their 90's is that you KNOW the time is limited. The more sad thing would be not to have them at all. Before we received the e-mail while in Russia, from Todd, telling Golden and I that Nick was ill, I'd just said a prayer for him at St. Basil's in fact-- one of those little ironies... a small Chicadee--Nick's favorite birds, washing himself in a sand pool near a window, had prompted me to do so. And I thought "I really need to try to call Nick when I get back home." Then the message came, and by the time we were able to get through to Todd, to tell Nick we loved him, Nick wasn't able to talk on the phone. Todd told him though that I was in Russia, and Nick was able to say "Good for her!" I'm smiling, because that was typical Nick as well. What I know I'll miss immediately is that whenever I needed an ego boost, all I had to do was give Nick a call. If I was feeling down, he'd always say something that brightened my day. He was always giving me pep talks and telling me he thought I was doing an amazing job. It's nice to have people like that in your life, you know. There are always plenty of the other kind. Nick would always apologize for "talking my ear off," I'd laugh and say "Nick, don't be silly. I love talking to you." And it was true. Nick may have been 90+, but he had a younger heart than many 40 year olds that I know. And Nick, my dear friend, I so wish you could talk my ear off right now. I never grew tired of listening. Convention Bookings for 2014!-- And here's our partial line-up! Conventions and events 2014 will be upon us before we know it. And I'm already doing the schedule for bookings with Eva Ink Artist Group and our associates, as 2013 comes to a close. Requirements-- for most of our talent-- are airfare (arriving the day before the show and leaving the day afterwards), hotel and table(s). If there are other requirements, I'll list them next to the artist, or let you know when you inquire via e-mail. Michael Golden, Mike Zeck, Arthur Suydam, Dennis Calero, Matt Triano, Rodney Ramos, Ric Meyers, Konstantin Komardin… check out the encapsulated bios below! We touch on film, comics, martial arts, animation, gaming, television, and so much more with this talented line-up! And more names to be added in the next few weeks. We also have suggestions for panels, promo items and more to coordinate with you once booked. Important: If you already know your dates, please get with me as soon as you can, about the talent you are requesting information on.... And: If we've already spoken about booking a certain talent with you, please reconfirm via e-mail . Here's a partial line-up--in alphabetical order. More to come! With a style that encompasses super-heroes, film noir, horror and just about any genre you can name, artist Dennis Calero recently finished the highly acclaimed series "Alex Ross's Masks," and is currently the regular sequential artist on "Army of Darkness," with writer Steve Niles. Recent work also includes "The Shadow," "X-Men Noir" "Legion of Super-Heroes," "Magic: The Gathering," "The Night Stalker," "Star Trek: The Next Generation," "Cowboys vs. Aliens," "Dungeons and Dragons," and "X-Factor" which was honored with a Harvey Award for Best New Series during his tenure. 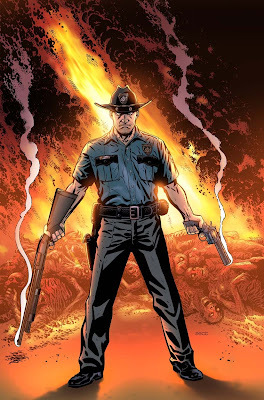 As well as being a versatile penciler, Dennis is also a sought after colorist, while also working in the world of film and television on his own properties, including "The Devil Inside." Programing notes: Any number of panels can be arranged with Dennis that encompass overviews of his career, or focus on his amazing skill set. 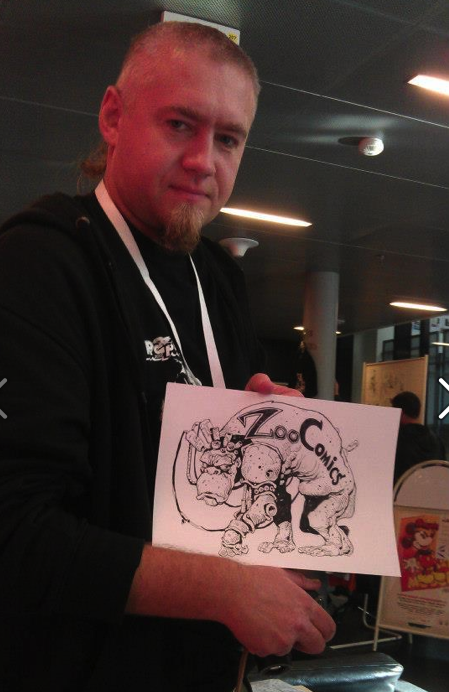 Komardin is an award-winning sequential artist, graphic artist and animator. His work includes the BD magazines “Veles,” “Hacker,” “Max Cooler,” “Moulin Rouge,” “Timof” which published his story “Siberian Dreams,” and the renowned comics “Agent Z,” “Sit-o-city,” “Gate of Alice,” and “Mechanics of Senses.” Konstantin was awarded the Grand Prize for “The Site of Polis” at the Moscow Comics Festival. His animation works include the concept designs on “Elka,” “Man with the Wind in his Head,” which was featured at the Suzdal Film Festival, “Tram,” “Spindel” which was honored at the Moscow Short Film Festival, and “The Man in Penze Nez,” which screened at both the Suzdal Film Festival and the Moscow International Film Festival. Programing Notes: Konstantin can do panels on animation as well as sequential art for your show, and talk about the cross-cultural world of comics. 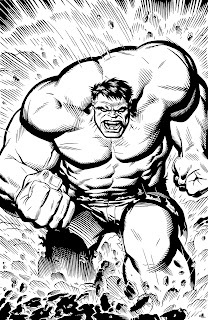 Novelist Richard S. Meyers is responsible for the Marvel prose novel featuring the Hulk among others, but around 100 other books as well! Creator of the Destroyer series, Ric is also the writer of "Santa Confidential," illustrated beautifully by artist Chris Browne of "Hagar the Horrible" fame, "The Kung Fu Movie Book," featuring everything you want to know about the martial arts world, and is the director of "The Kung Fu Movie Movie." 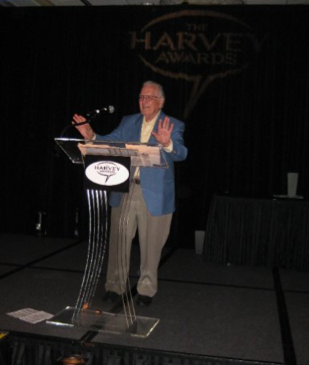 His commentary is sought after on director cuts of movies and television compilations worldwide. As well as acting (most recently as a villain in a Scotland filmed production), Ric has been called on as an expert consultant for such projects as "Twilight Zone," and "Kung Fu Panda." He yearly runs the Marital Arts movie segments at the San Diego Comic Con. 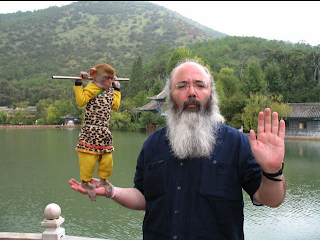 Programing Notes: Ric is available for a plethora of programming, Kung Fu, comics, film and otherwise! Screening of his movie works are also possible. 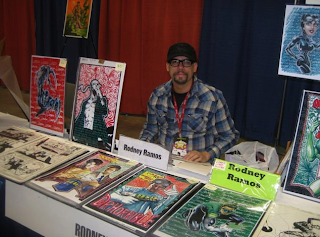 Artist Rodney Ramos has worked on just about every major character for Marvel Comics and DC Comics with a flourish that makes him a master at his craft. He began his storied journey in comics as a Romita Raider at Marvel Comics, learning his craft under the legendary John Romita, Sr. Regular work on titles like "Psi-Force," "What The!?" "Thundercats" "Punisher War Journal," "Amazing Spider-Man," and "Iron Man" followed, as well as work on Green Lantern, Batman, Wonder Woman, and much more. His works include masterful craftsmanship for clients ranging from Valiant, Malibu, Acclaim, Marvel UK, and Neal Adams Continuity Studios, in addition to Marvel and DC. He reached cult status with his work on DC's "Transmetropolitan," a huge fan favorite, and most recently over Simon Bisley's pencils at Legendary. Matt Triano is known for his illustrative work on both super-hero and fantasy/horror projects. "Grimm's Myths and Legends," "Robyn Hood," "Call of Wonderland," "Sleepy Hollow," "The Story of Mankind" for the Discovery Channel, "Shark Week" illustrations for Discovery Channel, "The Shadow," "The Lone Ranger Annual," and more highlight his amazing work and insistence on research and story setting. His attention to detail and design has most recently been seen in the series "Sherlock Holmes: The Liverpool Demon," which was released to great reviews. In addition to his story work, Matt also is a storyboard artist, working on motion comics projects and developing custom comics for high profile clients. Other works include material for Robin Hood Charities in New York, work on Marvel Trading Cards and Batman work for the "DC Halloween Special." Programing Notes: Matt is available for programming at all the shows he attends. Writer, editor, colorist and publisher Renee Witterstaetter has edited such books as "Hercules," "Xena," "X-Files," "Conan," "She-Hulk," "The Marvel Holiday Special," "Impossible Man Summer Special," and too many books to mention here. As a film professional, she has worked on such movies as "Red Dragon" and "Rush Hour 2," while also behind the scenes, racking up credits on dozens of music videos and commercials for artists as diverse as Madonna, Seal and Usher. Her books as a writer include: "Jackie Chan: Dying for Action," "Nick Cardy: The Artist at War," "Excess: The Art of Michael Golden," "Nick Cardy: Wit-Lash," "Art of the Barbarian," and her children's book "Kerry and the Scary Things." In addition, combining her film work with comics, she is a producer on DVD's on various comic book creators and talents in other fields as well. 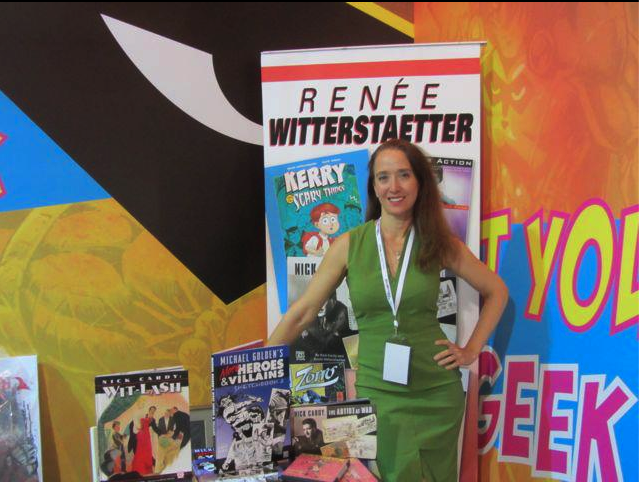 Programing Notes: Renee is available for portfolio reviews and commentary on working in the publishing industry. Okay, let's get the ball rolling! I may be adding a few more very exciting artist names before the end of the year, as well as a few names from the world of film and television. Looking forward to hearing from you, and discussing your show, gallery event or store appearance. Mike Zeck will be at Wizard Ohio, so bring your books by our table in Artist Alley to get 'em signed. What a show it's going to be: Mike Zeck, Michael Golden and Rodney Ramos, all in the house. And of course I'll be there with my line of books, including my newest one, "James O'Barr: Uncoffined." While Zeck won't be sketching at the show, we do have some pre-done sketches available, and we will be selling books and prints, so come by or contact me for details at: evaink@aol.com. Michael Golden and Rodney will be sketching and offering prints. Again, contact me for details. Skybound and Wizard World’s Sixth Limited Edition Cover in the Wizard World series. Free to Full-Price Attendees; VIPs To Receive Additional B&W Sketch Cover! Renowned creator Mike Zeck will create the sixth in a series of exclusive Wizard World variant covers of Robert Kirkman’s The Walking Dead #1 comic, provided for free to all full-price attendees at Wizard World Ohio Comic Con, September 20-22 at the Greater Columbus Convention Center. Wizard World and Skybound, Kirkman’s imprint at Image Comics, have teamed to produce the line based upon the Eisner Award-winning groundbreaking comic book series and best-selling graphic novels written and created by Robert Kirkman. Zeck will be on hand at Wizard World Ohio Comic Con to sign copies of the limited-edition comic, produced in extremely limited quantities and available to fans only while supplies last. 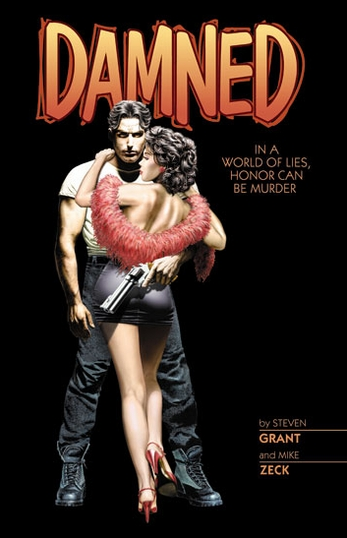 The first five covers, illustrated by superstar artists Michael Golden, Arthur Suydam, Julian Totino Tedesco, Neal Adams and Ethan Van Sciver, respectively, were huge hits at Wizard World events in Portland (February, Golden), St. Louis (March, Suydam), Philadelphia (June, Tedesco), New York (June, Adams) and Chicago (August, Van Sciver). A different creator will draw the variant cover art for the two remaining scheduled Wizard World shows this year in Nashville (October) and Austin (November). Zeck, who has influenced generations of artists, counts the “Kraven’s Last Hunt” series, one of the highest-regarded Spider-Man storylines ever, and “Circle of Blood,” a highly-touted treatment of “Punisher,” as two of his most recognizable works. Independent third-party comic book grading service CGC, a leader in the industry, will accept TWD #1 variant and Signature Series submissions at its Wizard World Ohio Comic Con exhibitor booth. The 2013 Wizard World Ohio Comic Con will also feature Eisner Award Hall of Famer Stan Lee, Laurie Holden of “The Walking Dead,” pop culture icon William Shatner, Summer Glau (Serenity, “Terminator: The Sarah Connor Chronicles”) and WWE® Superstar Sheamus® among a standout roster of top celebrities, as well as an array of superstar comics creators. 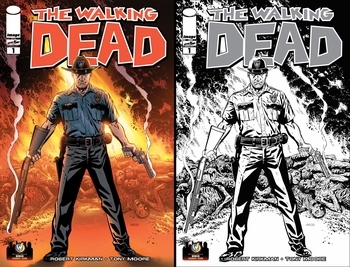 The Walking Dead graphic novels accounted for seven of the 10 bestselling titles of the year and were #1 overall for both 2011 and 2012. Wizard World Ohio Comic Con, produced by Wizard World, Inc. (OTCBB: WIZD), will bring together thousands of fans of all ages to celebrate the best in pop-fi, pop culture, movies, graphic novels, comics, toys, video gaming, television, sci-fi, gaming, original art, collectibles, contests and more. Admission is free for kids 10 and under. Event hours are Friday, Sept. 20, 3-8 p.m.; Saturday, Sept. 21, 10 a.m. - 7 p.m., Sunday, Sept. 22, 10 a.m. - 5 p.m.
Mike Zeck and Michael Golden VIP Prints at Wizard New York Experience! New York-- This upcoming weekend marks first Wizard New York Experience, and to add to the occasion, the show is featuring two VIP prints from two ground-breaking artists, Mike Zeck and Michael Golden. Known for his iconic work on "Captain America," "Kraven's Last Hunt," "Secret Wars," and much more, the NYCE is the first time in almost 2 decades that Mike Zeck has made an appearance in the New York area--And to mark that occasion, his VIP print freatures an alluring image from his creator-owned property with writer Steven Grant, entitled "Damned." 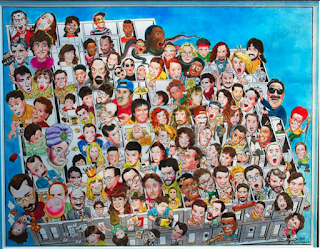 Michael Golden, legendary artist on "G.I. Joe," "Doctor Strange," "The 'Nam," "The Micronauts," and co-creator of Rogue of the X-Men, and much more, Michael's VIP print takes a more whimsical turn with the cover of the children's book "Kerry and the Scary Things," with writer Renee Witterstaetter. The New York Experience takes place June 28, 29th and 30th at Pier 36 (Basketball City) in NYC. 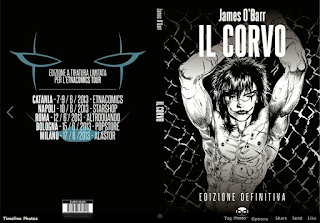 Announcing our signing tour for artist/writer James O'Barr to celebrate the Italian edition of "The Crow." The tour will take place this June, and features stops in Sicily, Rome, Naples, Bologna and Milan. Big Wow this Weekend! 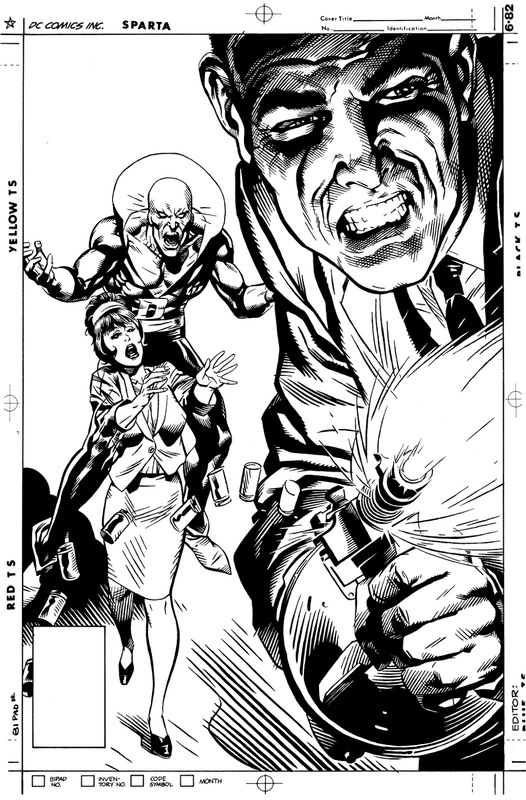 Auction to Feature Michael Golden Inks! San Jose, CA-- One of the original art friendly conventions is taking place this weekend in San Jose, Ca, May 18-19th, at the San Jose Convention Center. Drop in for the event and be sure to visit the Eva Ink contingent, this time with artist Michael Golden, artist Mark Texeira and writer Renee Witterstaetter. Books, prints original art, and sketches are available during the event. 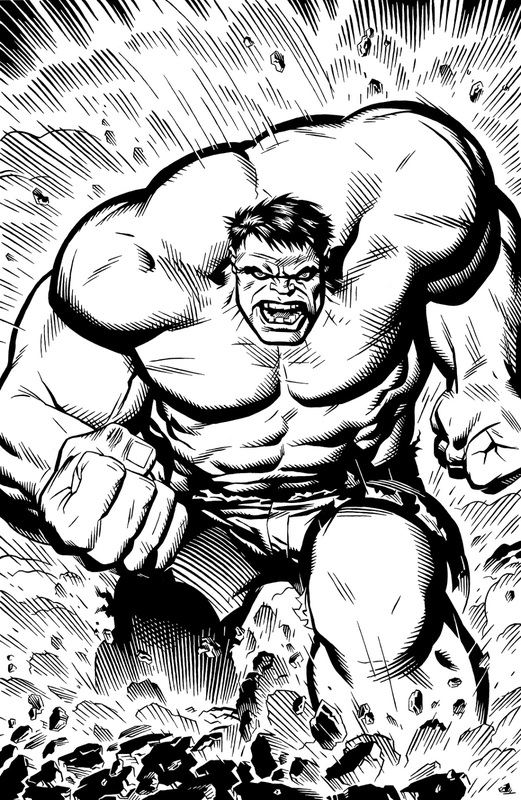 In addition, Michael Golden have inked three pieces for the auction, which is one of the highlights of the weekend. 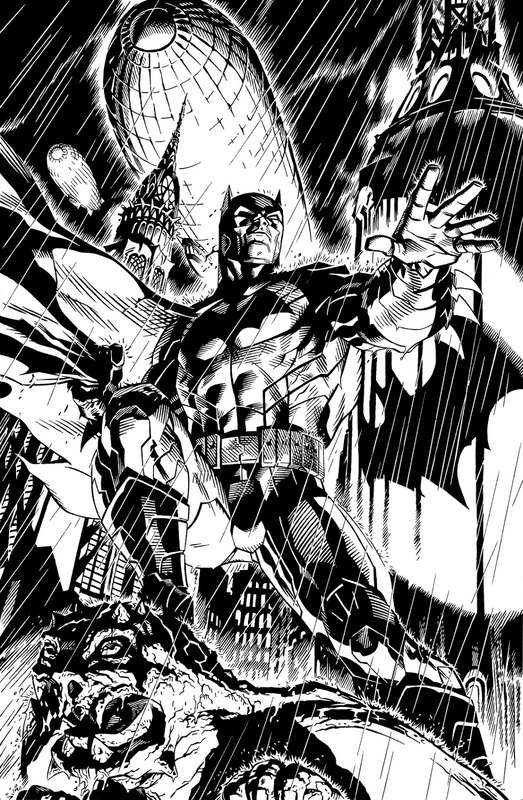 This years offering include his inks over pieces by Jim Lee, Neal Adams, and Liam Sharp. My recent travels have taken me to Easter Island and Santiago, Chile. While there, I was asked for an interview on my career in the comic book world. Always happy to oblige. This one seemed to focus on my experiences as a woman in the industry, which I have to say, has over all been positive. Even though I know it would make for a better interview if I could dish some dirt, I really don't have much dirt to dish. Any who, for my own views, here 'tis. the artists you work with draw you. This one by Mike Zeck. 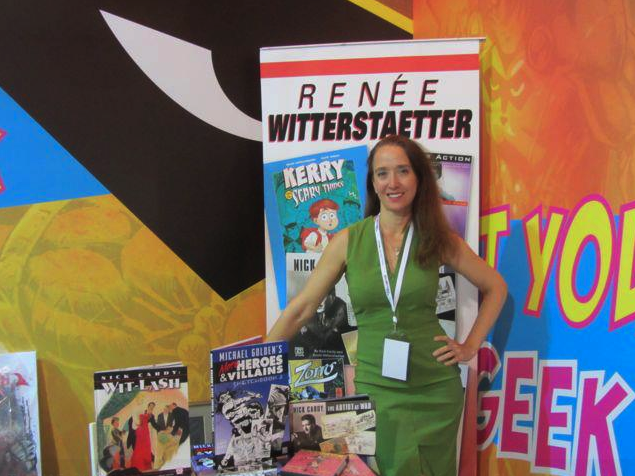 Interview with Renee Wittestaetter by Juan de Dios Dougnac, Santiago, Chile, April, 2013. Juan de Dios Dougnac: The usual perspective about the comic book world and the geeky entertainment industry in general, like video games, and anime conventions and comic books is usually about a world dominated by men, a very masculine, very misogynistic. That’s the idea one gets by reading specialized websites and I wanted to ask you how was it to be a woman in a world mainly dominated by men. but as far as dungeons go, it wasn't so bad. Renee Witterstaetter: Well, I never had a problem with it, and I actually never even think about being at a disadvantage. I like being a woman. And, I have always tried to go out and make my own opportunities. I grew up with two older brothers, so I was very used to being around men and I was something of a tomboy when I was growing up. I was the kind of girl that would like to go fishing and hiking and camping, and all that - -granted, however, it's true there were not that many women in the comic book industry when I first started. I can probably count with one hand the women that I knew that were working in the industry. But remember, you didn't really have very many women even going to conventions at that time either. As far as working in the industry, me personally, although I have heard some bad stories that other women have told, personally I was given mostly opportunities: to be an editor, to learn and to work with some amazing people. If I did have a bad story or two, I probably wouldn't tell it. No need. All my bosses in comics were men. (Conversely, working in film, most of my bosses were woman.) 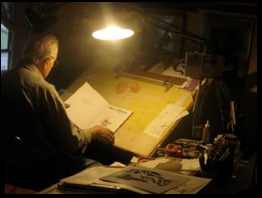 In comics, Mike Carlin taught me a great deal about putting together comic books when I started at DC comics as a green assistant editor on the "Superman" books. And from there my friend and mentor Jim Salicrup at Marvel comics was a great teacher, he was the "Spider-ma" editor and later my boss at Topps; my immediate boss, Craig Anderson on the "Silver Surfer" books at Marvel was amazing; and another one of the best bosses I ever had was Mark Gruenwald at Marvel, who really took everybody--all the assistants--under his wing and taught us all his passion for putting together comic books. By that time there were a lot more women in the industry. I never felt like I was ever being discriminated against, and I was also given plenty of opportunities to do female oriented books. I was the editor on She-Hulk for a long time. 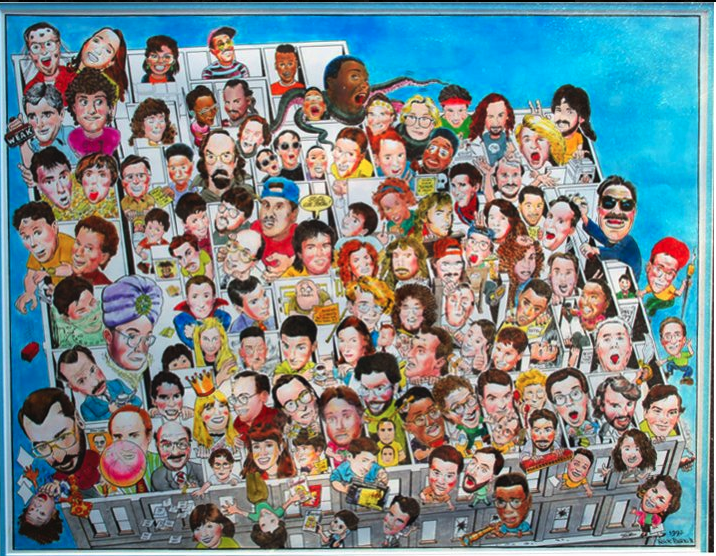 Rick drew this in '92 of co-workers at Marvel at 387 Park Avenue South after they redesigned the offices and moved people around. The multi-talented Eliot R. Brown drew the building. 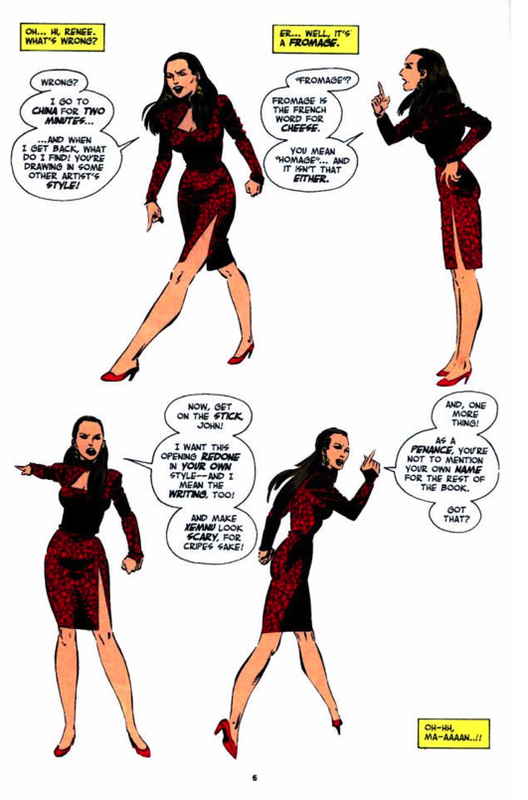 J: Yes, I saw some funny images of you talking to She-hulk about how men deserved to get their money taken away from them if they thought She-hulk would be naked on the comic. 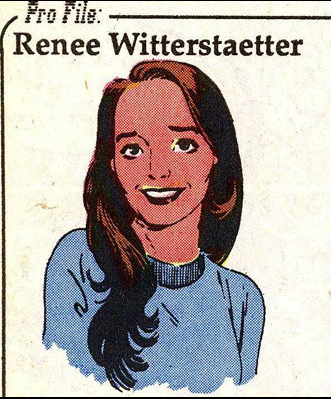 One of several instances with Renee as a character in the "She-Hulk" comics. J: You mentioned there were few women working in the comic book industry. Did that change in the recent years? R: It's always changing. When I first started, like I said, there were very few women, maybe five that I knew of. By the time I was an assistant editor at Marvel, there were many more women on staff. That’s changed even more so now. There are more and more women working in comics now. There are more writers, inkers, pencilers, that are very well known and female editors that have made a big impact on the industry. You also need to look beyond the Big Two, and see what's going on in other types of comic books and sequential art. It's wide open. With wide avenues to explore. 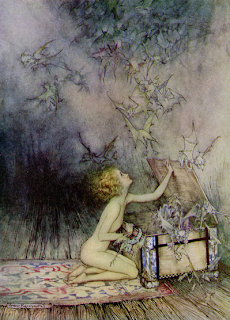 We always could use more creative people, though, so I hope more women will continue to be drawn to the genre. It's kind of a trap though, defining people and putting them into categories isn't it....I don’t like defining people... not by their race, or their sexual preference or anything else. I hope that someday we can say, that if you excel at whatever job you want to do, doors will open. Sure, it may not always be smooth. But, I don't think any bumps I had in the road were due to my gender. Although when I first moved to New York from Texas, some folks did make fun of my "flower-print" dresses. It was some time before I adopted the "all black" uniform of the city. (laughs) But, in short, I'd love for there to be more women creators in comics. The more talented people that join our industry, the better. We also need to try to find ways to expand our industry. Trying to create good stories that attract both men and women should be our focus. J: So you would say that allegations of sexism in the industry are exaggerations by people that see it from the outside or do you think there is sexism but in other areas of the industry? R: You can say that about any business I suppose? Of course it exists. The only thing I find funny sometimes, is that in instances when a women has to be tough, she's sometimes called the "B" word, or something similar. That doesn't really happen if it's a man that says the same thing, in the same way. That I just laugh about. But I'm still a tough negotiator and advocate when I need to be. Doesn't change any thing. J: The other thing that impressed me was the incredible diversity of working experience you’ve had, you’ve done many different things, like working in many different comics of very different themes. You’ve also worked in films and music videos, as agent, editor, colorist, pretty much all there is to do in comics and film. At a recent appearance and book signing in the Middle East. R: Pretty much except penciling, yes. I also did draw as a kid, like many kids, but didn't continue. Now I'm writing more, and am still involved in film production, which may take up more of my time in the future. J: So, how do you not go insane by doing so many different activities? Do you just take it one thing at a time? R: It’s called being freelance. I was an editor for a long time, as well as an assistant editor. When you’re starting out as staff at DC comics or Marvel the pay was not very good as an assistant editor. So you had to do a lot of freelance work if you want to live in New York city, which is pretty much where you had to live if you wanted to work at one of the comic book companies. So I would be an editor by day and a colorist by night, get a few hours of sleep then turn around and go back to work the next day. So coloring and maybe some of the writing at the time was a necessity, there wasn’t necessarily a choice, it’s something that I had to do, that every assistant editor had to do to make enough money to live in New York. You couldn’t live on your assistant editor salary and as far as I know the salary hasn’t gone up by much from when I started, it’s still about the same. Later on, of course I enjoyed coloring, I enjoyed writing. After I stopped working in an office I started my own publishing company called Eva Ink Publishing, and of course when you’re running your own business sometimes you don’t work eight hour days. 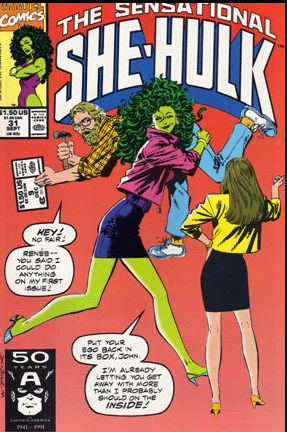 Page from "She-Hulk." I wish I had a dress like that. Sometimes you work ten hour days, sometimes you work weekends. I don’t find it to be something that drives me insane, I love what I do. I feel very fortunate to be working in a creative industry where I get to set my own hours, I get to publish the books I want to work on, and it’s the same with film production. I have enjoyed every movie, every commercial, every music video that I’ve worked on because it’s exciting to be creative and create something that millions of people are going to see. So I think I would be bored if I wasn’t so busy. J: Have you had the chance to visit other conventions here in Latin America? Are you familiar with the comic book market here? How do you think the comic book industry in Latin America is evolving? R: It’s different in different parts of Latin America. I’m becoming familiar now with comics in Chile. I think there’s some amazing talent in Chile. I was just looking at the book by Berna on Rapa Nui yesterday. That’s a beautifully done book and something with historical and educational significance. My friend Felipe, who helps run a convention in Chile is writing a book and a friend of his is drawing it and the art work is lovely in that book. There’s just a lot of exciting things going on in Chile. And I hear also in Peru, Argentina, Brazil, etc. The reason I love to go to these conventions I haven’t been to before is to see new talent, to see what’s going on in the rest of the world. I hope to go to a lot more conventions in South America. J: I hope so too. J: Chile has had an incredible explosion of creativity on the last few years. There have been a few tabletop games, card games, role playing games, comic books, webcomics, etcetera. There’s probably a lot of people who wants to make something, whether on the comic books industry or in other industries. Focusing on the comic book industry, what do you think someone must do in order to stand out in case his talents aren’t related to art? R: Well, it’s harder for a writer, because you have to get someone to actually sit down and read your work, and that is difficult. 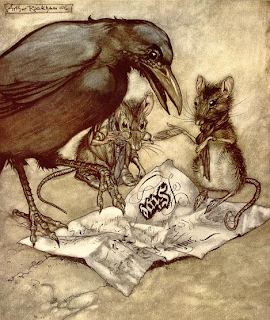 If I were a writer looking to publish a new book here, I would find an artist to team up with, someone whose work was good, someone who knew storytelling and work with them to develop a story. There are lot of ways to get your work out there: webcomics are a great way to go now because you get your property out there online and your ideas are copyrighted, you don’t have to worry about anyone stealing your ideas because of the copyright notice in there, it establishes your property… So that’s what I would do if I were a writer looking to break in. I would find someone to team up with, someone who would be a good working partner and artist. "Make good comics or else!" 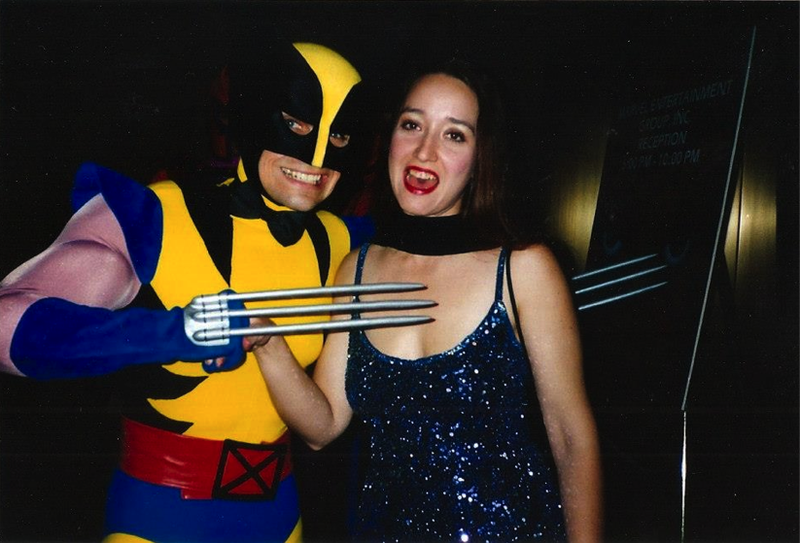 One of the legendary Marvel Christmas parties. J: Just one last question. What do you think makes people want to come here, to Chile, to South America, to suffer the long travel hours to come to a place where you don’t speak the language? And it’s not just you. There are lots of incredibly talented and famous people here. What do you think it is that makes them choose Chile or South America? R: For me, I like to travel to different shows that invite me because I like to experience a different culture. I think we learn a lot by going to other places and seeing how other people live, what’s important to them, what their culture is, what their interests are. We don’t learn anything by staying in our own little place in the world. You only learn and grow by going out and seeing what the rest of the world is like. I love to do cross cultural things. The first day we were here we—James O'Barr, Arthur Suydam and myself-- went to a local school and talked to the school’s children about comics and putting together comics and what we do. I think it’s very important to share, because the more you get to know another place the more you get to understand them. For example, two weeks ago I was in the middle east, I was in Jordan and the UAE. Some of my friends said “Why are you going to the middle east?” and I said “I’ve never been there before and they invited me”, so I went. And by the way, since we are having a talk about women, I was floored by the amazing young girls (as well as boys) in the UAE interested in drawing and sequential art and trying to find ways to get involved in comics. It's becoming easier for them now, but still something not as widely available as in other parts of the world. In short, the people were lovely and I had never been to that part of the globe before and it gave me a new understanding of what’s important to them, and their culture, and how they think. And it’s the same coming here to Chile, I’ve never been to Chile before and the people here are warm, open and friendly. And, making sequential art that reflects their world view. Now I have a better understanding of what it's like in this part of South America. It’s very important as a writer and someone who works in a creative media like myself to see what it’s like in other places, to learn and to get to know people and their culture. It adds authenticity to anything I work on, the wider my world view. I think we grow as humans the more we know our fellow people. And sequential art is a wonderful tool to use. Agent/Editor at Large. 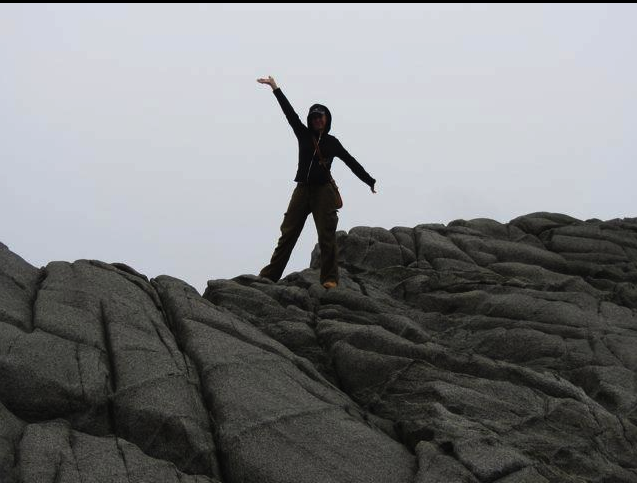 Hiking in Chile. 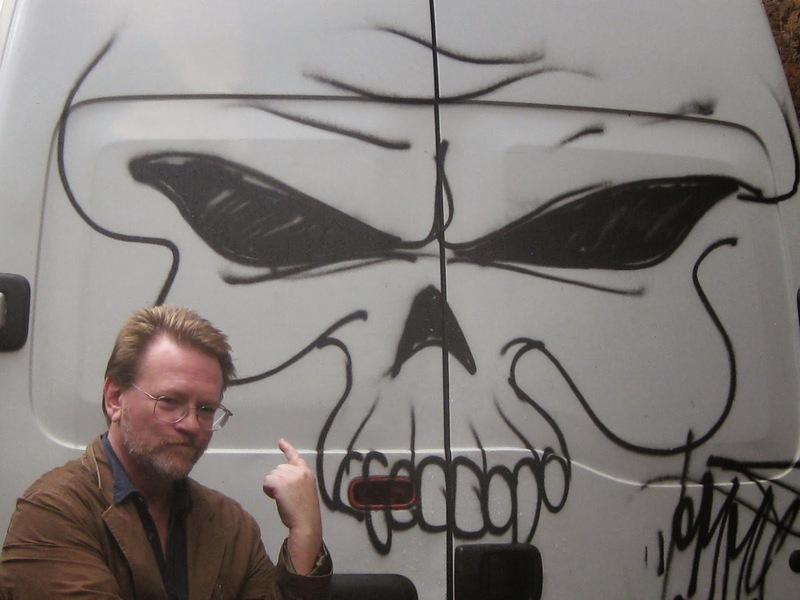 Mike Zeck to Appear at "Wizard New York Experience" in June! Michael J. Zeck, renowned comic book illustrator and storyteller, is making a rare convention appearance at Wizard World NYC Experience. Zeck’s epic six part story “Kraven’s Last Hunt,” with J.M. Dematteis and Bob McLeod, springs immediately to mind. This groundbreaking series took the Spider-man character to a whole new level, and has been touted by readers as the “Greatest Spider-man story of all time,” in recent polls. The Limited Series “Secret Wars,” set the comic book readership on their ears, and brought a new black-and-white costume design for Spider-man (designed by Zeck) which is still recognizable and indelible to this day. Spider-man wore the costume temporarily, and it still lives on in the form of the super-villain, Venom. 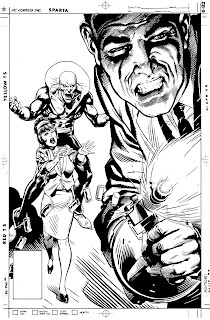 In short, when you stop and think of the t-shirts sporting Zeck images, the homages to his covers, the lineage of his storytelling, you need a long sheet of paper to start writing them down. Michael J. Zeck it seems, always knew he would work in the arts. Born in Pennsylvania and growing up in South Florida, he later attended the Ringling School of Art in Sarasota, Florida, his eye always on working in the sequential art field. 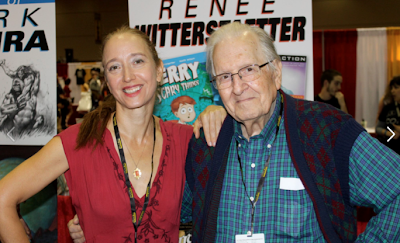 He began that career at Charlton Comics with their animation-related line of comics leading to horror titles, later moving on to Marvel Comics. Some of his first work at Marvel included “Master of Kung Fu” and “Captain America,” with many more titles, at numerous companies, to follow from there. 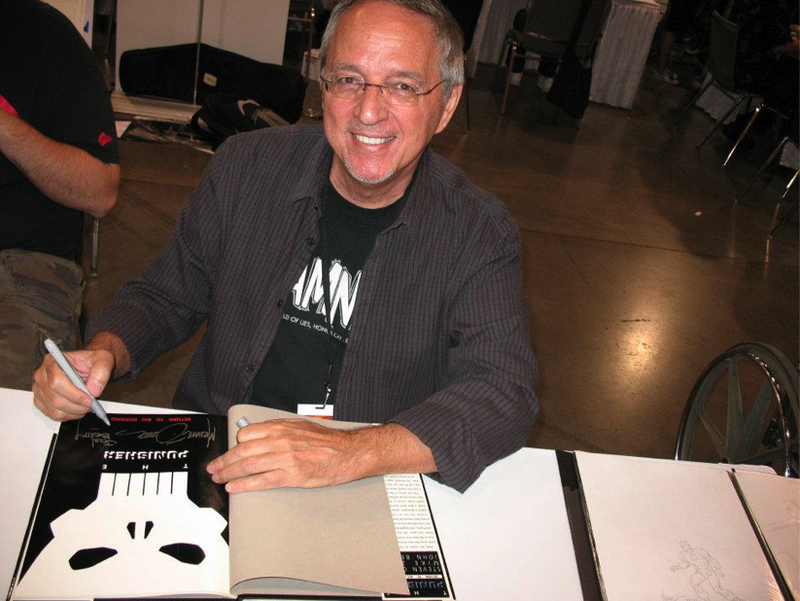 Zeck’s work has graced the pages and covers of “Aquaman,” “Batman: Legends of the Dark Knight,” “Green Lantern,” “G.I. Joe,” “G.I. Joe: Special Missions,” “Lobo,” “Deathstroke The Terminator,” “The Eliminator” and too many titles to mention here. As part of the VIP package at the NYC Experience to commemorate this rare appearance, Zeck will be promoting his creator-owned project “Damned” (with writer Steven Grant), with a limited edition poster. A new collected edition of the series “Damned” will be published by BOOM! Studios this fall.
" Uncoffined" Sketchbook from Eva Ink--Available for Ordering! New York, NY-- We are pleased to announce that Eva Ink Publishing is soliciting our first in a series of James O'Barr sketchbooks to coincide with his convention appearances with Eva Ink. This first in a series book will feature never before published James O'Barr sketches in a striking black and white format. 36 pages. The title "Uncoffined" conjures the fact that these sketches are being shared from James's personal collection, in published format, for the first time. The book will be available in the next Diamond Catalogue in the Eva Ink (aka Little Eva Ink) section, and will be offered in both a Signed and a Sketch version. and as such had poor communication skills. and has been using them ever since. not rich by any means. who is apparently afraid of what he would do with Batman. He paints draws and writes every day. edition sketchbooks on name artists. Publishing also packages books for other creators and companies. 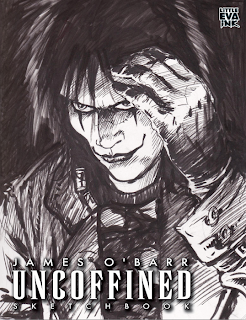 Be sure to place your orders now for "James O'Barr: Uncoffined" with your local comic shop, and/or contact Eva Ink at: evaink@aol.com to inquire about convention bookings or book purchasing. Michael Golden Cover Kicks Off "Walking Dead" Exclusives for Wizard! 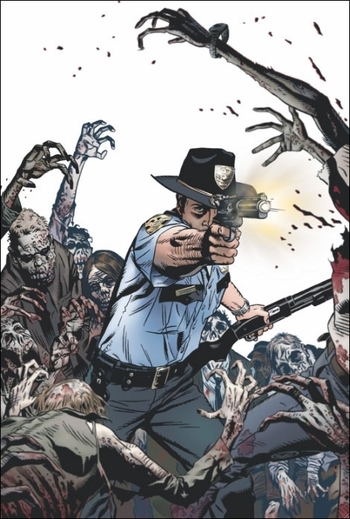 First TWD #1 variant cover by comic writer/artist Michael Golden debuts at Portland Comic Con, Feb. 22-24! Robert Kirkman, creator and writer of the groundbreaking, Eisner-Award winning The Walking Dead comic book series and graphic novels continues to break records in all of its incarnations. Wizard World and Skybound, Kirkman's imprint at Image Comics, have teamed to bring fans what they want, more of The Walking Dead! Now, all full-price attendees at every Wizard World event in 2013 will receive a limited-edition, exclusive cover variant of The Walking Dead #1. A different superstar artist will create the variant cover art for each of the eight scheduled shows this year. Comic book writer/artist Michael Golden illustrates the first variant cover at Wizard World Portland Comic Con, Feb. 22-24 at the Oregon Convention Center. At each event, the cover artist will be on hand to sign fans’ copies. More cover artists will be announced shortly. The exclusive The Walking Dead #1 editions will be produced in extremely limited quantities and are available to fans only while supplies last at each Wizard World convention. Michael Rooker and Norman Reedus, stars of the AMC series based upon The Walking Dead will attend Wizard World Portland Comic Con. Comics legend Stan Lee, Happy Days star Henry Winkler, Evil Dead star Bruce Campbell, Homelandheadliner Morena Baccarin and WWE® Superstar The Miz® are among the other headliners. 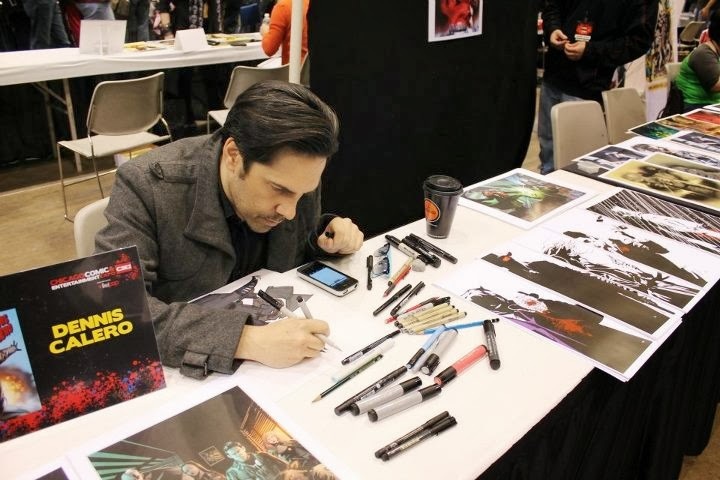 They will be joined by a top-drawer collection of well-known artists and a variety of activities, exhibitors and special attractions in the first event on Wizard World’s 2013 calendar and the first Wizard World event in Oregon. Wizard World Portland Comic Con, produced by Wizard World, Inc. (WIZD.PK), will bring together thousands of fans of all ages to celebrate the best in pop-fi, pop culture, movies, graphic novels, comics, toys, video gaming, television, sci-fi, gaming, original art, collectibles, contests and more. Admission is free for kids 10 and under, and Sunday, February 24, is “Kids Day,” an array of programming specially designed for children. 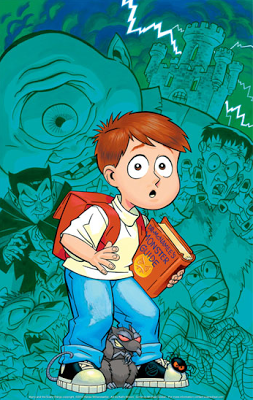 Event hours are Friday, Feb. 22, 3-8 p.m., Saturday, Feb. 23, 10 a.m.-7 p.m and Sunday, Feb. 24, 10 a.m.-5 p.m.
Michael Golden is one of the world’s most popular comic artists, having provided artwork for G.I. Joe, The Adventures of Superman, Batman, The Micronauts, and many other groundbreaking series, including The ‘Nam. He is the co-creator of Rogue from the X-Men as well as Bucky O’Hare and Spartan X. 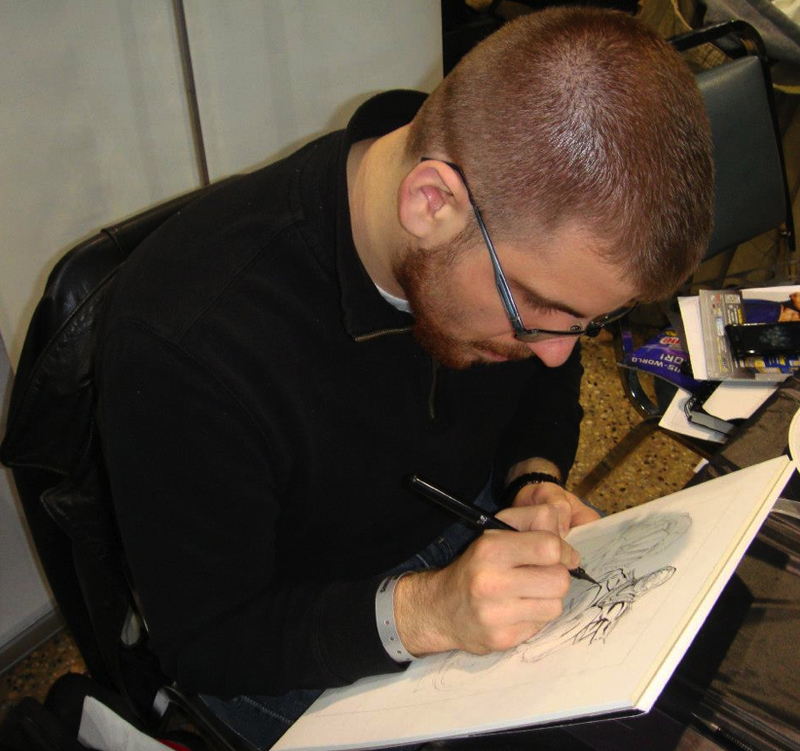 He has served as an editor at DC Comics as well as Senior Art Director at Marvel Comics. In addition to continuing to create sequential stories, and covers, he also conducts classes in storytelling at venues around the world. The 2013 event schedule to date can be found at www.wizardworld.com. Wizard World is a producer of pop culture and multimedia conventions across North America that markets movies, TV shows, video games, technology, toys, social networking/gaming platforms, comic books and graphic novels. It has the rights to the names, marks, domains, customer lists and production rights for a portfolio of pop culture and multimedia conventions.